I have to start by saying that we had a great time. This is an amazing ship, everything you heard about it is true. It is strikingly beautiful and to say that it is innovative is an understatement about how edgy and modern Allure is. So the facts are in. It’s time to make waves and rock the boat, and The Smart Traveler has the scoop about the biggest cruise ship ever built. “She is a man made wonder of the sea” that’s the impression I had when I was driving to Port Everglades in Fort Lauderdale and I saw the Allure of the Seas waiting for me that sunny Sunday morning. Ten ships were at the port that day and the traffic to get through the control gate took longer than the time that took us to unload the car, park, check-in and get to our cabin – 15 minutes! Impressive when you think that 6,360 people had to checked in on that day. 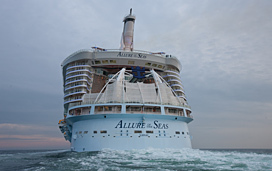 Yes, there was 6,360 passengers on board plus 2,100 crew members bringing the total to the staggering total of 8,460 people on board of the Allure. When we first entered the ship, everywhere we looked we had the WOW factor. And we kept saying WOW until the day we left… sometimes for all the wrong reasons. After the safety drill, thousands of passengers headed to the Promenade and I heard a fellow passenger saying once he saw the mob roaming around that area: “This is like traveling on Wall Mart on a Black Friday! ” And he was right. Several times during the cruise that comment came back to mind. Allure is great in every aspect, except that you can’t hide 6,360 people confined in the same space with you for a week, even if that is a really big space! Beautiful neighborhoods, Promenade, Central Park, Boardwalk, everything is impressive. Don’t worry about getting seasick – you will hardly notice that you are on a ship. You have almost two dozen places to eat, from pizza to sushi, from steak to caviar, and everything in between. If you want a special meal, you have to pay extra, but the average cruise ship food is included… nothing to write home about, just really average RCL food. And you will leave the place after almost three hours, hungry! See the video about Rita's Cantina, the new Mexican restaurant at Allure. If you have been in other cruises, you can’t avoid noticing that they are cutting corners with the restaurant schedule. Remember the good old times when the buffet was open until 11:30PM and then they had the midnight buffet? Forget about that. The buffet closes at 9PM and the only thing you can eat at midnight is a piece of pizza at Sorrento’s or a snack at the Promenade Café. Everything else will be closed until morning. To travel on the Oasis class ships you will have to pay premium price, so why Royal Caribbean is cutting back on dinning hours and options? My time dinning is a complete disaster. After a presentation of Chicago we went for dinner on the main dining room at 8:45PM, along with 1,500 people that left the theater with us. There was long lines, it took us half an hour to get into the restaurant (and we had a reservation) and another hour after that to get the food. The manager apologized saying that everyone was eating late that night and he sent us desserts from Chops. Nice, but the problem is still there and it happened to other guests in different nights. We are being used as guinea pigs by RCL to introduce something that NCL has being using successfully for years, my time dining, and after my experience I can say that RCL have a long way to go before they can make it work, especially on the Oasis class ships. The problem again is that they are charging premium rates but they are not providing premium service! There is something really innovative on Allure, the healthy food option. There is the solarium buffet that serves breakfast and lunch and everything is healthy… for those into healthy living like me, this is a great addition to the cruise ship industry. There is also the Spa Cafe where you can buy protein shakes, natural juices and smoothies. The cabins are comfortable, well appointed, tastefully decorated and with all the technologies you need – interactive TV, i-pod dock – really nice, just lacking storage. But nothing that you don’t find on NCL, Princess or Celebrity. If your cabin faces Central Park or Boardwalk, sometimes you will believe that you are on a building complex. These pictures are from my cabin (9207) facing Central Park. Watch the video clicking here! You will never have to wait more than 5 minutes for an elevator. The glass elevators are beautiful and you can appreciate the amazing neighborhoods when riding in one of them. The Promenade – one of Allure’s neighborhoods – it’s wider and with a lot more stores and food venues than Royal Caribbean’s Freedom and Navigator class ships. The area attracts a lot of people night and day. So if you don’t like crowds and loud music, avoid this neighborhood and go to Central Park where you will find peace, on an open sky oasis in this very busy ship. The Boardwalk is a real treat with a carrousel and all the atmosphere of Atlantic City’s boardwalk. The amazing Aqua Theatre is at the end of the Boardwalk where you will have the WOW factor looking the ocean from the open back side of the ship. 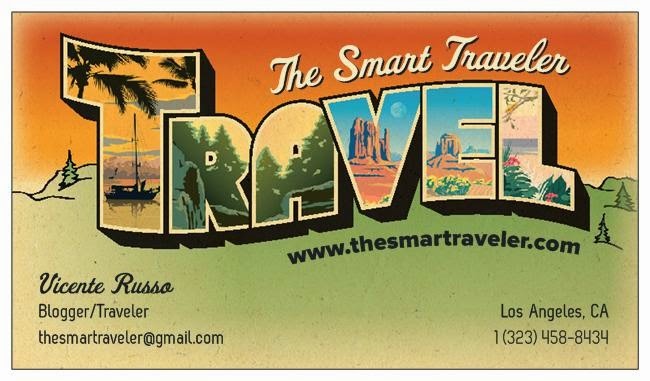 Next week The Smart Traveler will talk about the Entertainment and activities on the Allure and the ports of call. Allure's gym and spa: click here! I just got back from the Allure. I was a little bit disappointed. The windjammer buffet has gone down hill. I think it is because they want everyone to eat at the fancy restaurants where you have to pay. This will be my 6th and last cruise for a looong time. Sad they don't do the midnight buffet anymore too.